Are you sure you want to leave Old Lyonians Football Club? The Old Lyonian Football Club (now Old Lyonians FC) was founded in 1902 and was initially set up by former pupils of The Lower School of John Lyon. The club joined the Southern Amateur Football League in 1924-25, of which it remains a member. It is also affiliated to the Amateur Football Alliance. Old Lyonians FC is an 'open' club, with Old Lyonians, friends and family members playing for the teams. The club fields five 11-a-side squads plus a VETS team in league and cup competitions throughout the winter season (September to April), with matches played on Saturday afternoons. The club house is The Lyonian Pavilion at South Vale, Harrow, HA1 3PN. The home matches are played on the Senior Pitches of the John Lyon School and are of a very high quality. 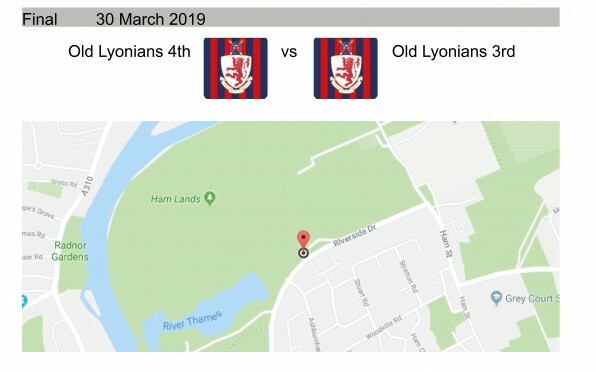 The Lyonian Pavilion has been recently refurbished providing excellent changing facilities, with a well stocked bar and games room the teams and their opposition can relax after matches. In 1963 the Old Lyonian Football Club won the Old Boys Junior Cup Final beating Old Bromleians. The score line was Old Lyonians 3 (Barris, Mindel, Maynard) to Old Bromleians 1.